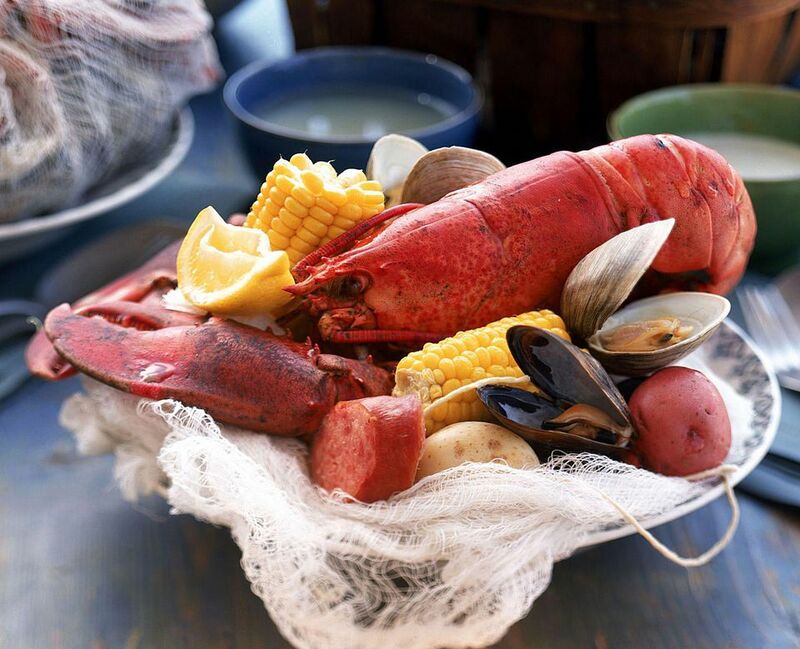 This recipe for a stovetop New England clambake brings the shore to your table with ease. Adding the ingredients in the right order is the secret to this recipe's success. The ingredients that take longest to cook go in first. For this recipe, you will need a large pot (18 to 20 quarts) and cheesecloth. Put the clams, mussels, and cornmeal in a large bowl, and add enough cold salted water to cover. Let this stand for about 30 minutes to purge the clams and mussels of any sand. Lay a 12-inch piece of cheesecloth on a flat surface. Arrange the celery, parsley, thyme, and peppercorns in the center. Gather the ends of the cheesecloth together and tie it tightly with string (this is called a bouquet garni). Place the bouquet garni in a very large pot (about 16 to 20 gallons). Fill the pot about halfway with water and bring it to a boil over medium-high heat. Add the lobsters head first, and cover the pot. Boil the lobsters until the shell is bright red, about 8 minutes. Using tongs, remove the lobsters to a large bowl. Add the potatoes and onion to the pot. Ladle off excess water, leaving enough to cover the vegetables. Cover and cook for 10 minutes. Layer the sausages and corn over the vegetables. Cover and cook until the potatoes are just tender, about 10 minutes more. Rinse the clams thoroughly. Arrange the clams over the corn and sausages. Place the lobsters on top of the clams. Cover the pot and boil until the clams have opened (about 10 minutes). Remove the pot from the heat. Using tongs, remove the seafood, corn, potatoes, and chorizo to large platters or rimmed baking sheets. Mound the seafood in the center, discarding any unopened clams and mussels (these are not safe to eat). Surround the seafood with the potatoes, corn, and sausages. Sprinkle the vegetables with salt and pepper. Cover with foil to keep warm. Discard the bouquet garni from the pot and strain the cooking liquid through a fine sieve into a bowl. Add the butter, swirling to melt. Divide the broth among six small cups to serve with the seafood. Squeeze the lemons over the clambake and serve right away. Steamed Garlicky Mussels for dinner - quick, easy and economical!